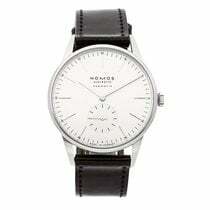 NOMOS is one of the most famous and successful German watch manufacturers. Their award-winning watches are world renowned for their tidy, linear designs. Two of their most popular models are the Tangente and the Metro. High-quality watches with in-house calibers and award-winning designs – that is NOMOS Glashütte. Located in a small Saxon town, this company is considered a whiz kid in the watch industry and is one of the largest German watch manufacturers today. Some of their most famous and coveted models include the Tangente, the Orion, and the Metro. The latter of which wasted no time accumulating prizes for its masterful combination of modern and classic design elements. NOMOS has been an owner-run, independent business since its foundation in 1990. Their in-house calibers and technology further underscore this manufacturer's independence. The NOMOS Swing System is one of their greatest successes. Introduced in 2014, it took NOMOS and their external partners almost seven years and 12 million euros (approx. 14 million USD) to develop this escapement. Very few watch manufacturers are able to build their own escapement system, which includes a balance, spring, lever, and escape wheel. This makes NOMOS' achievement all the more impressive and serves as a statement of independence to the entire watch industry. 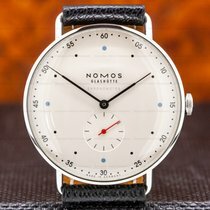 How much do NOMOS watches cost? The Tangente is NOMOS' most famous model. It's probably what most people think of when they hear the NOMOS name. This should come as no surprise since the Tangente is the company's best-selling and most manufactured watch. A round case, tempered hands, a small seconds dial, and thin, angular lugs characterize this timepiece. Alternating Arabic numerals and long indices emphasize this watch's clean design. Like many NOMOS watches, a cordovan leather strap keeps the Tangente securely on the wrist. This type of leather comes from a horse's hindquarters and is very durable and hydrophobic. There are many versions of the NOMOS Tangente available. The classic version is 35 mm in diameter and powered by the in-house caliber Alpha. Thanks to this extremely flat manual caliber, the Tangente ref. 101 is only 6.2 mm thick. This classic NOMOS costs around 1,000 USD pre-owned. You can purchase a new timepiece for about 1,400 USD. Prices for a Tangente with a date and power reserve display sit between 2,200 and 2,500 USD. If 35 mm is too small for you, you may enjoy the 41-mm Tangente Update. Introduced in 2018, this watch has an innovative date display: Two red markers frame the date around the dial edge. This helps keep the Tangente Update remarkably flat. Despite its automatic caliber, it is still only 7.9 mm thick. The neomatik caliber DUW 6101 with the NOMOS Swing System powers this timepiece. Never-worn, this watch sells for around 3,100 USD. Smaller, 35-mm automatic Tangente neomatik watches with no date cost about 2,500 USD new and 2,200 USD pre-owned. The 39-mm version of the Tangente neomatik also lacks a date and demands around 2,900 USD in mint condition. Pre-owned examples are still rare since this model is quite new. The Orion has domed crystal and features only the essentials. Its design is more restrained and minimalist any other NOMOS watch. Thin minute and hour indices adorn the dial. Thanks to its domed sapphire glass, the Orion conjures up images of a UFO when viewed from the side. Similar to the Tangente, the Orion is available with a classic manual caliber or a flat neomatik movement. Case sizes for the Orion range from 33 to 41 mm, with the smallest models geared more toward women. You can purchase a mint-condition timepiece with a steel case back for about 1,400 USD new and 1,300 USD pre-owned. If you'd like a view of the movement through a sapphire glass case back, be prepared to spend another couple hundred dollars. Prices for the 35-mm version with a stainless steel case back sit around 1,600 USD new and less than 1,200 USD pre-owned. At 36 mm, pieces with a neomatik movement are only slightly larger. This model costs anywhere from 2,300 USD for a pre-owned timepiece to 2,700 USD for a new one. Larger Orion timepieces are 38, 39, or 41 mm in diameter. The 41-mm edition comes with a date display and is powered by the in-house caliber DUW 6101 – the same movement found in the Tangente Update. That being said, NOMOS equipped the Orion 41 with a classic date window at 3 o'clock. Set aside around 3,100 USD for a mint-condition NOMOS Orion Neomatik 41 Date. You can save a few hundred dollars by choosing the 39-mm model without a date display. Orion 38 watches feature one of two classic NOMOS manual movements: The Alpha is in timepieces without a date and the DUW 4101 is in those with a date at 6 o'clock. The latter is more expensive due to its proprietary escapement, with prices ranging from 1,700 USD pre-owned to 2,100 USD new. Watches without a date display sell for between 1,600 and 1,800 USD. How much does a Metro with a manual caliber cost? The NOMOS Metro debuted alongside the Swing System in 2014. As its name suggests, the Metro is a wristwatch meant for the city, which is why it feels more modern and playful than most NOMOS watches. Renowned designer Mark Braun is responsible for the Metro's design, which has garnered quite a bit of praise. In fact, the Metro is so popular that it went on to win numerous awards and accolades soon after its release. A knurled crown, wire lugs, and thin hands that resemble the Empire State Building are all unique features of the Metro. The dots for the hour and minute markers are also a defining feature of this urban timepiece. The manual caliber DUW 4401 ticks away inside the "typical" Metro. This movement has a date display at 6 o'clock and a patented, multicolored display on the upper half of the dial that shows how much of the 42-hour power reserve remains. New, this 37-mm watch demands around 2,800 USD, while pre-owned pieces sell for about 2,700 USD. The 38-mm models with no date or power reserve display are especially simple. You can get a mint-condition example for as little as 2,000 USD. The same timepiece changes hands for about 1,600 USD pre-owned. With a date display, this watch costs between 2,100 and 2,300 USD. The NOMOS Metro is also available with the automatic caliber DUW 3001 and a 35 or 39-mm case. When it comes to the dial, you can choose between white, midnight blue, silvercut, and champagne. Champagne dials feel a bit more feminine and are, therefore, only combined with a 35-mm case. Regardless of the dial color, prices for a 35-mm Metro Neomatik timepiece usually sit around 2,900 USD. The elegant silvercut model with a 39-mm case is only slightly more expensive: It costs around 2,700 USD pre-owned and 3,000 USD new. The NOMOS Metro Neomatik 39 in midnight blue sits in a similar price range. The highlight of this collection is the 39-mm Metro in rose gold. It is one of the few gold watches produced by this Glashütte-based manufacturer. The combination of a silvery white dial with gray hour indices feels simple and refined. Its hands are also plated in rose gold. The automatic caliber DUW 3001 powers this version of the Metro. Despite having an official list price of 9,700 USD, if you're lucky, you may find a never-worn example on Chrono24 for under 6,900 USD. There are a few more gold watches in the overwhelmingly stainless steel NOMOS catalog. The Lambda and Lux collections are exclusively made of watches in rose or white gold, making them the finest timepieces NOMOS has to offer. Plan on spending around 14,000 USD for a 42-mm Lambda in 18-karat rose gold. Its manual caliber, the DUW 1001, boasts an 84-hour power reserve. The smaller, 39-mm model is slightly more affordable at about 12,300 USD. The white gold editions are also 42 mm in diameter and demand around 15,200 USD in mint condition. The barrel-shaped case of the NOMOS Lux helps it stand out from the crowd. Multicolored dials only add to this gold watch's playful yet elegant look. Like the Lambda, the Lux is only available in white or rose gold. The manual caliber DUW 2002 ticks away inside these timepieces. NOMOS intricately decorates every movement and outfits them with an 84-hour power reserve. Never-worn watches in rose gold cost a solid 14,100 USD. The white gold version is more expensive and sells for almost 16,200 USD. The NOMOS Tetra is truly unique thanks to its square case. It was also one of the first NOMOS watches, having premiered alongside the Orion, Ludwig, and Tangente in 1992. Its dial resembles that of the Tangente with its alternating Arabic numerals and indices. However, this square wristwatch has a much more feminine feel thanks to its smaller cases and colorful dial. That being said, there are also simpler versions with medium cases that are great for both larger and smaller wrists. You can call one of these unisex Neomatik watches your own for around 2,900 USD new and 2,400 USD pre-owned. The NOMOS Tetra Grenadine from the Petit Four series has a pomegranate-red dial and gold-plated hour and minute hands. At 29.5 x 29.5 mm, it is the perfect timepiece for women. It's powdered by the Alpha caliber. New, this timepiece costs around 1,800 USD. At Baselworld 2018, NOMOS announced a new, rather sporty model: the Autobahn. The design of this 41-mm watch is reminiscent of a car's speedometer. NOMOS brought famous furniture designer Werner Aisslinger on board to help design this timepiece. Its most distinctive feature is the eight small boxes made of SuperLuminova that arch across the dial. The hour hand is also generously coated with the luminous material, making the Autobahn easy to read in the dark. A small seconds dial sits above the date display at 6 o'clock. The automatic caliber DUW 6101 is 3.6 mm thick and serves as the engine behind this timepiece. The final watch has a total thickness of 10.5 mm. A robust, water-resistant textile strap keeps the Autobahn securely on your wrist. Furthermore, its water resistance of 100 m (10 bar, 328 ft) means this watch can also be worn while swimming. Prices for this timepiece sit between 3,100 USD pre-owned and 3,800 USD new. The Ahoi is NOMOS' sports watch. Luminous hands and hour markers mean it's always easy to tell the time, even in the dark or underwater. In fact, the Ahoi is water resistant to 200 m (20 bar, 656 ft) . A crown protector shields the screw-down crown from impacts and underscores this watch's sporty feel. The Tangente-like dial is very tidy and makes it clear that the Ahoi is a NOMOS. A water-resistant textile strap completes the look. The NOMOS Ahoi is available in various sizes and with different automatic movements. The most eye-catching models have a siren white, siren blue, or siren red dial and are the perfect timepieces for a summer day at the beach. The Ahoi Atlantic is a bit less flashy. Its dark blue dial is both sporty and elegant. There are also watches with white silver-plated dials available. Both the Ahoi Atlantic and the versions with a white dial suit formal occasions and casual social gatherings. They are truly the ideal companion for everyday life. A NOMOS Ahoi with a steel case back, no date, and the automatic caliber DUW 5001 costs around 2,600 USD new. You can purchase a pre-owned example with a white dial for under 2,300 USD. Prices for models featuring a date display and the caliber DUW 5101 sit between 2,800 and 3,200 USD. The Ahoi Atlantic is also available with or without a date display. Both variants are a few hundred dollars more expensive than their respective sister model with a white dial. If 40 mm is too large for you, you may prefer the Ahoi Neomatik. This timepiece is 36 mm in diameter and comes in a number of different editions, including those with a siren red or siren blue dial. The Ahoi Neomatik Siren Red demands around 3,200 USD new and 2,800 USD pre-owned. NOMOS has received numerous accolades for their watch designs and technology, including the Red Dot Design Award, German Design Award, and Goldene Unruh. Bauhaus has had a clear influence on their watches, which are characterized by their clarity, minimalism, and straight lines. As part of their commitment to simple industrial designs, the company is a member of the Deutscher Werkbund (German Association of Craftsman), the precursor to Bauhaus. NOMOS also gives their watches a modern touch and often collaborates with famous designers like Mark Braun and Werner Aisslinger. Roland Schwertner , a computer expert from Düsseldorf, brought NOMOS Glashütte to life in 1990, shortly after the fall of the Berlin Wall. 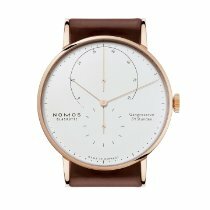 The brand's name comes from the long-defunct Nomos-Uhr-Gesellschaft (Nomos Watch Society). From 1906 to 1910, the Nomos-Uhr-Gesellschaft distributed Swiss pocket watches out of Glashütte. However, this was soon prohibited and the company was shut down for misleadingly advertising their watches as being from Glashütte. Schwertner decided to bring the brand back to life, though this came with similar difficulties. Since "Glashütte" is part of the company's full name, he had to prove that NOMOS watches were mostly manufactured there – and he did. Over time, NOMOS went on to develop more of their own calibers. Today, the company boasts up to 95% vertical integration of their in-house movements. To receive the Glashütte designation of origin, only 50% of a watch must be made in Glashütte. Very few companies around the world can compete with NOMOS when it comes to in-house production. The Glashütte-based manufacturer uses both automated machines and laser technology as well as traditional craftsmanship to produce their timepieces. The streamlined exterior of a NOMOS watch often hides an intricate world underneath. The ultra-thin automatic caliber DUW 3001 premiered in 2015. At just 3.2 mm thick, the DUW 3001 is very unique. Usually, more space is required for automatic movements. Thus, it garnered quite a bit of press when it was released. NOMOS watches are popular among politicians and celebrities. The current German president, Frank-Walter Steinmeier, and former US President Bill Clinton are both proud wearers of NOMOS timepieces. These Glashütte watches also have fans in the film industry. Both James Bond and Rocky, or rather Roger Moore and Sylvester Stallone, are each said to own a NOMOS Tangente Millenium.